If you struggle with recurrent headaches, the list of possible causes can be daunting. Pain of any type that occurs in any part of the head falls under the broad definition of “headache.” Headaches can be a symptom of a different health problem or caused by temporary chemical imbalances in the brain. 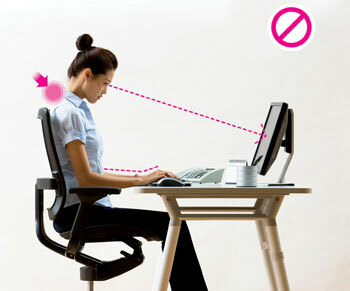 Headaches can be also stem from poor posture. We spend our 9-to-5 sitting at a desk typing away and our free time scrolling our smartphones; these lifestyle factors keep the head and shoulders chronically hunched forward. 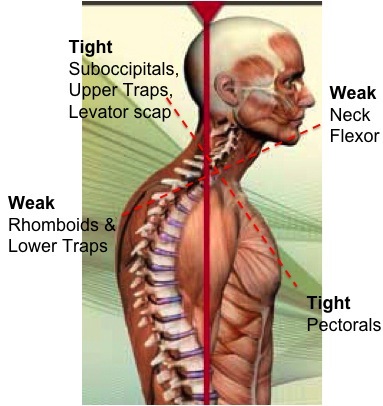 The muscles in the front of the neck become under-used and over-stretched while the upper trapezius muscle works overtime fighting against gravity. At the chest level, the hunched shoulders allow the pectoral muscles to shorten and tighten while the shoulder blade stabilizers take a vacation. Headache pain is only one painful consequence of this movement pattern. In physical therapy, corrective exercises, strength training, and postural education will go a long way in preventing or reversing this postural position. But two hours a week in physical therapy can’t compete with a 40 hour work week if you fall back into the head-forward position at the office. Time for an office overhaul! 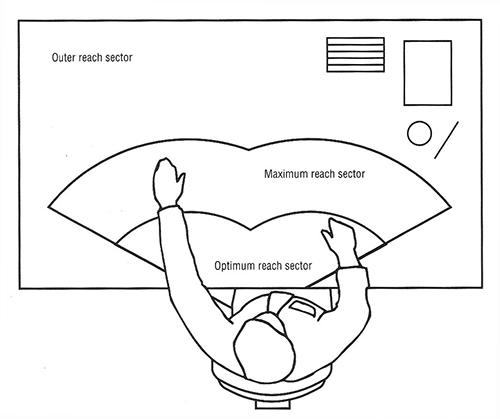 Adjust your monitor position: The center of your computer screen should be approximately eye level. If possible, the screen can be tilted slightly forward so that the entire screen is in the line of sight. Adjust your line of sight by moving your eyes instead of your neck: Once the monitor is in position, your neck can stay in a neutral position. Instead of moving your neck, you can see your entire screen moving only your gaze. Directly face your monitor: Keep your work station directly in front of so you do not have to rotate constantly to view your screen or use your mouse. Keeping frequenlty-used items within reach can also help you avoid rotating often. Get a document holder: If you typically refer to paper documents, a document holder can help you position them in a comfortable line of sight so that you are not forced to rotate your body or crane your neck forward to view them. Use a headset: holding your phone in place by clamping it between your neck and your shoulder won’t do you any favors. A hands free headset, bluetooth, or headphones with a microphone will remove this possibility. Once your office is shipshape, the other common culprit is the smartphone. Your phone isn’t stationary like your desktop, so you will have to keep these tips in mind every time you use it. There’s an app for that: There are apps circulating that will alert you if your phone angled too far forward (which might mean you are craning your neck forward to see it). 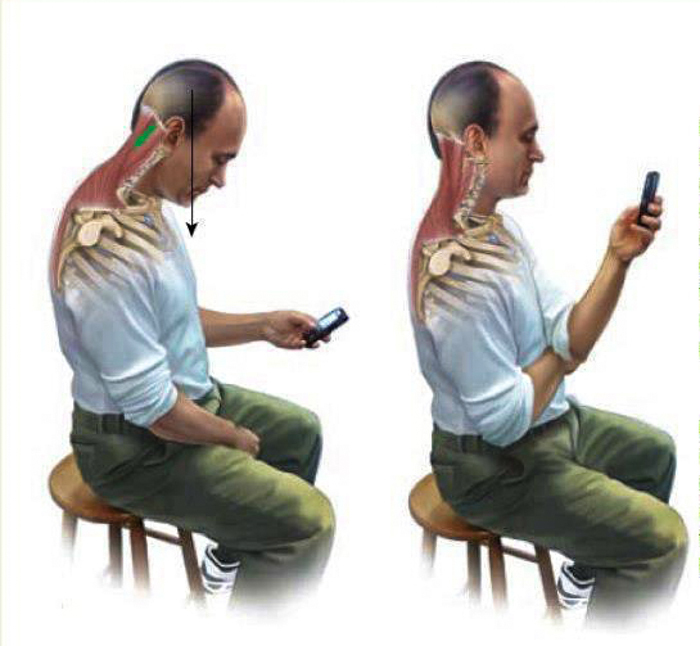 While this could be a useful cue, the app can only detect phone position and can’t correct your posture!